Right now I plan to keep updating the blog with new projects (hello, nursery decor! ), but we'll see how things go after we have two children under the age of one in our house. The flat orangey-camel paint had to go. Luckily, last night at Home Depot I found a gallon of a dark dusty blue color on the "oops" paint shelf for $5. I also wasn't sure what to do about the mirror situation. When we bought the house we asked our builder not to install mirrors so that we could add nicer framed mirrors of our own. (And we were able to apply a credit from the cost of the mirrors towards other upgrades we wanted.) We hung a plain framed mirror for a while, but then I found this at a yard sale for $10 and knew it belonged in this bathroom. The only problem was it was much too small for the space above the sink. I played around for a little while with the idea of doing some kind of decorative outline around the outside of the mirror to visually bulk it up (kinda like the painted headboard below), but I just wasn't sure if it would look right. Then I found these and knew they would be perfect. I added them to my Christmas wish list and my in-laws were sweet enough to buy them for me! Not bad for $15 and a little elbow grease, right? I still have some accessorizing to do, and I have plans for the vanity light (of course!). But for now I'm happy with how it looks. I've also been working on our laundry room and have started searching for fabrics and paint colors for the nursery, so keep checking back! Love it! The color is gorgeous (why don't i ever get lucky with the oops shelf?? ), and the mirrors are divine. And good luck and congrats on the adoption plans. Hope everything goes well. This is my first visit to your blog and I'm so happy I popped in. First off, congrats on the adoptions! Your lives are about to change in ways you cannot imagine and I will be here to watch your progress on your home and family. Love the look of the mirrors and so jealous you discovered the main piece at a yard sale for $10! I'm new to the land of blog but invite you to stop by when you find the time. Congrats on your plans for adoption! I can't wait to see your life as parents unfold on the blog! The bathroom looks beautiful, and I look forward to seeing your nursery plans! Best wishes to you in the coming year! BTW, love the mirrors. This is so fun! Love those little mirrors! And congrats on the adoption! My hubby and I want to adopt someday. I have friends that brought home three little ones from Ethiopia this year. What an adventure, but they LOVE it! Wow, you weren't joking about big news! The adoption sounds wonderful! Looking forward to hearing more about it. 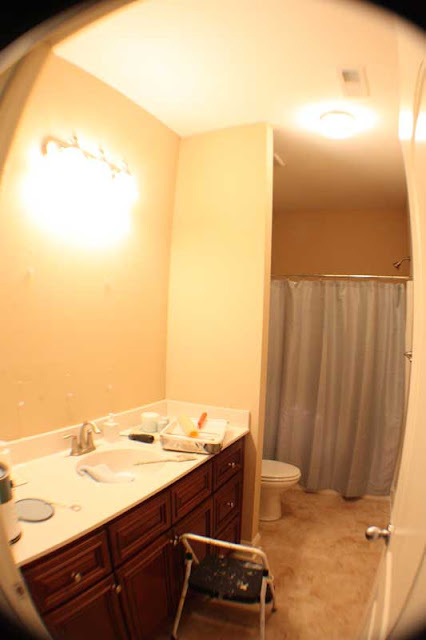 Love the bathroom makeover as well. That $10.00 yard sale mirror is amazing! Great find. AND how exciting to be adopting two babies at once. You are going to be a busy girl. It's good to hear from you and you were missed. Keep us all posted. 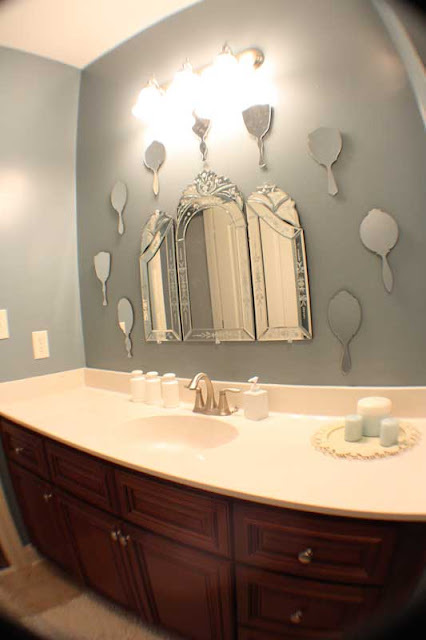 Your bathroom makeover is so pretty and so creative! I love the blue color~ congrats on the adoption, if you come by my blog and look at my sidebar, you will see a pic of my daughter Katie, who we adopted as a newborn~ I have a bio son and there is no difference! Wow! 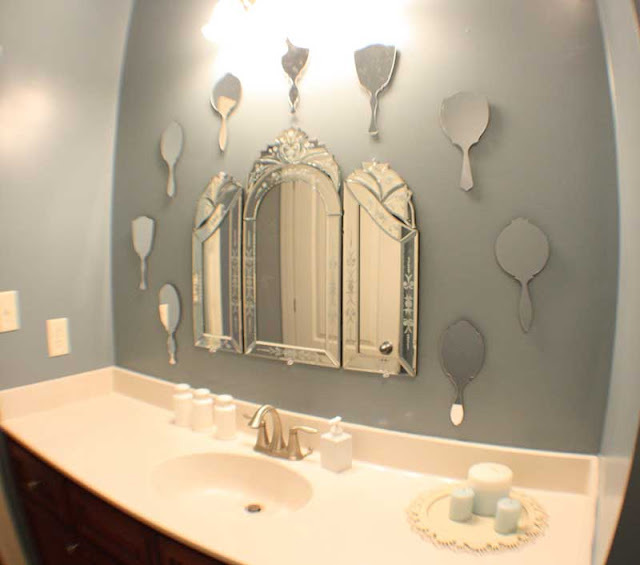 I love what you did with the mirrors! They made the bathroom so elegant! And congratulations on the adoption. Coming from a developing country myself, I am so happy that you chose Ethiopia. There's so many kind-hearted folks out there and you're one of them. Congratulations on the upcoming adoption! Looking forward to following on the planning of the nursery. 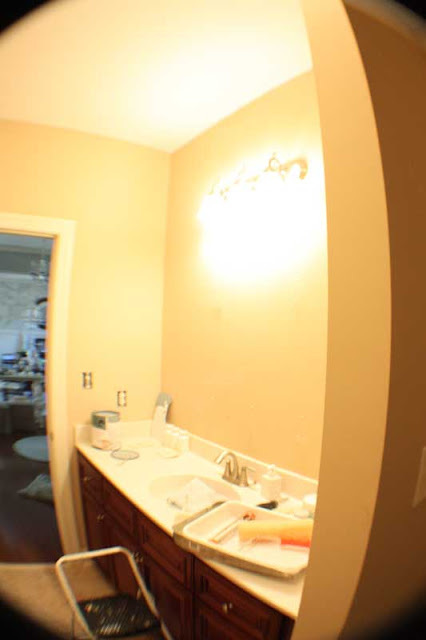 Your bathroom looks gorgeous. It is amazing how that paint color sets off the dark cabinetry and makes the space feel so rich. Good job, you! looks great! good luck w/ the adoption, what wonderful news... keep us posted! I love the finished look! 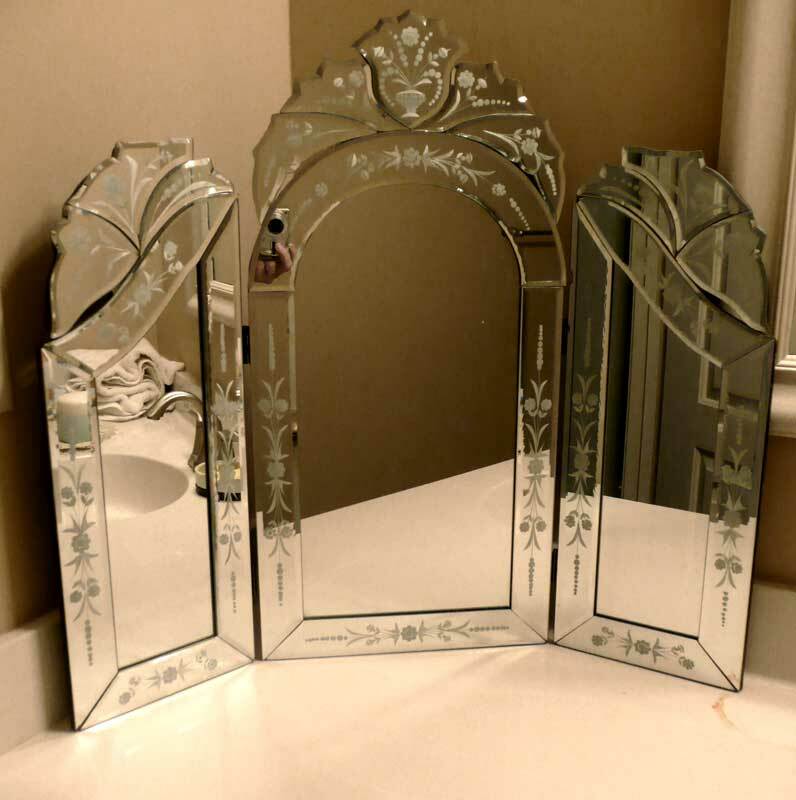 The mirror find is fabulous especially when combined with the other mirrors! Best of luck with the two babies! You will be a busy woman! I have a 4 year old and 2 year old & they always keep me hopping! How exciting for your family! Being a mom is the best thing in the world...even better than crafting! 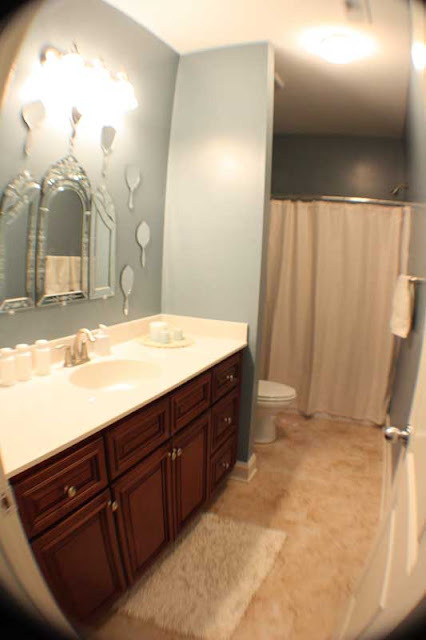 :) Love the bathroom, your makeovers are always so beautiful. LOVE LOVE LOVE your bathroom. What an adorable idea!!!! I love the mirrors! Adding the small ones was a great solution. Best of luck on your adoption journey! That is so exciting that you are planning to adopt! wow! This is my first time to your blog. I just linked over from somewhere today, can't even remember. Anyway, look forward to seeing your nursery decor ideas. I'm still figuring out what I want to do with mine. WOW ! WOW ! and WOW! if this were my bathroom I'd probably not want to ever leave it. SO beautiful. This is a wonderful look! And I love the wall color too. You can't beat $5.00! Congrats on adopting -- how exciting!! And wow, what a difference you made in the bathroom. Love, love, LOVE that dusty blue. My husband always laughs at me for looking through the "oops" paint, but you just never know when you'll find a treasure! I stumbled across your blog looking at your laundry room schoolhouse light. Very impressive! Then I was distracted by your Africa in the sidebar because we have one of those, too! We brought home our son from Eth in June. I'll be checking back in for updates and nursery pics, too! Best wishes!!! How did you hang those hand mirrors? I have some I'd love to hang in my bathroom but they were my grandmother's so I'm afraid to hang them without doing it properly! I have to say, in the before pictures I was hating your cabinets. But with that color and the added chic of the mirrors on the walls, they are fab. Congrats! We have a little girl from Ethiopia. I was surprised when I read this on your blog since I was looking at it for design ideas. What a nice addition you will have with 2 more. Good luck!